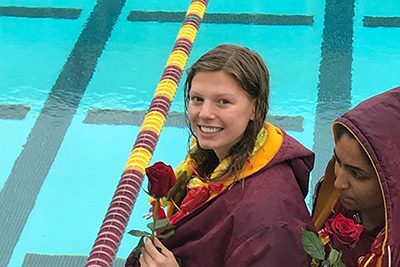 Congratulations to MPA alumna Emma Stacy ’15 who is currently a senior at Scripps College, and who was one of 11 members of the Claremont-Mudd-Scripps swimming and diving team to go to the NCAA Division III Championships in Indianapolis last year. Furthermore, she also traveled to Malaysia with the Keck Science Department to present her paper on the environmental effects of renewable energy technology. To read how Emma found a community at Scripps through swimming, as well as more of her accomplishments, click here.